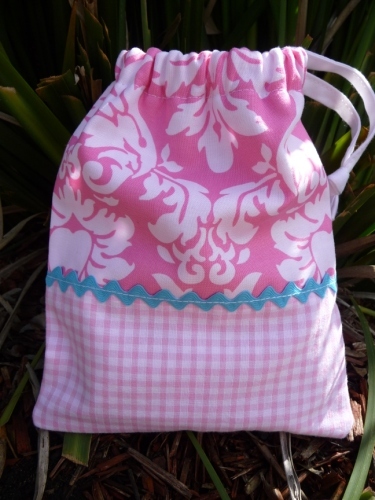 I just completed the drawstring bag tutorial on the sewbunnybum website. The funnest thing in the universe, to me, is fabric selection - picking matching fabrics and selecting contrast colours as well.. its a challenge and there's so many different paths you can take - love it! What process do you go through? I used some pink Michael Miller (Dandy Damask?) and pink gingham with a light blue ric-rac splash of colour. The bag is intended to keep a set of figurines in. fabulous bag! well done, lady.